« 2 – 5 March ’14 – Golden Sands of the Driest Desert in the World! We have got this packing thing down! It really is just like building a puzzle, and once you know where all the pieces go it is easier and easier every time. Each time I pack it seems like we have less and less stuff…this worries me slightly. We figure out how to walk back to the bus terminal, wheely cases over the desert sand and all. The sun beating down on my skin, the desert air not offering much relief. The small waiting room is packed with waiting passengers, all squashed into the heavy aired room – locals on to the next town, backpackers of many types and nationalities and even one man in a suit. He may spontaneously combust in that suit today. I wait outside in wait for some sitting space, a stray dog or two runs across the empty lot, and we all wait some more. I’m not quite sure about the punctuality of busses this far north in Chile, and just as I mentally thank this trip so far for teaching me patience, two busses arrive to whisk away the waiting from this desert town. Neither of which is ours..
My stomach rumbles but the nearest sandwich is a short run away, and our bus is already a bit late. I’m taking the chance, what if we come to a standstill in the middle of the desert? Two very important lessons in life – always have something to eat with you when going on a ride longer than an hour AND always wear matching underwear. I think about those two every time I leave..
Our Plan – Back to Calama, then 1. 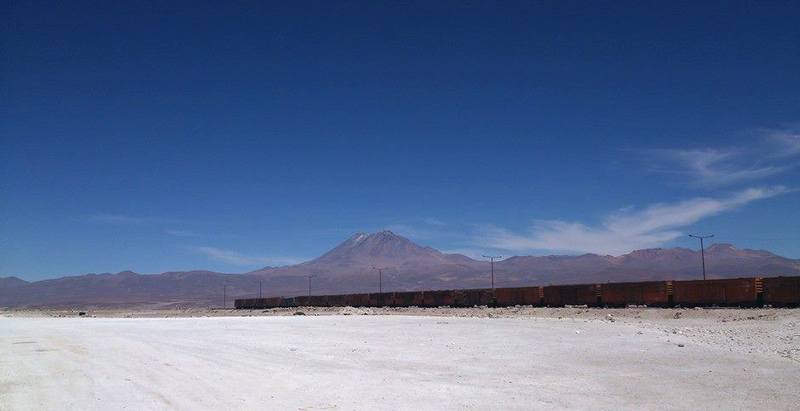 Catch the Frontera Bus to Uyuni at 22:00 OR 2. 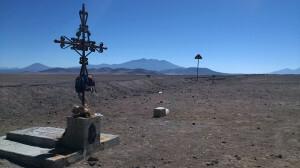 There is no 22:00 bus because the internet wants to trick us, and we take the 7am Atacama 2000 bus the next morning. 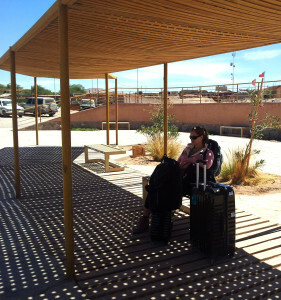 Which means we have to find somewhere to sleep once we arrive back in Calama at about 16:00. This can be quite a challenge in a mining town that doesn’t really cater to travellers. Option 2 it is – Challenge accepted! As fate may have it we find a space to rest our heads at the hostel just around the corner from the bus office for all three of us. Hostal Abaroa was just fine at 10 000 Chilean pesos each for the night. Good wifi + hot shower = all a traveller really needs. We settle in and hunger strikes again – it can be so annoying while travelling sometimes, this needing sustenance every so often, especially in a place with very limited culinary options. We decide to visit a local kitchen with many tables covered in slightly sticky plastic, red check table cloths. There is a very slim chance that anyone in this town speaks English, luckily my Spanish is up to communicating what we need, even if it is something between cavewoman and baby. For 2200 pesos you can choose a starter and a main from the day’s menu. 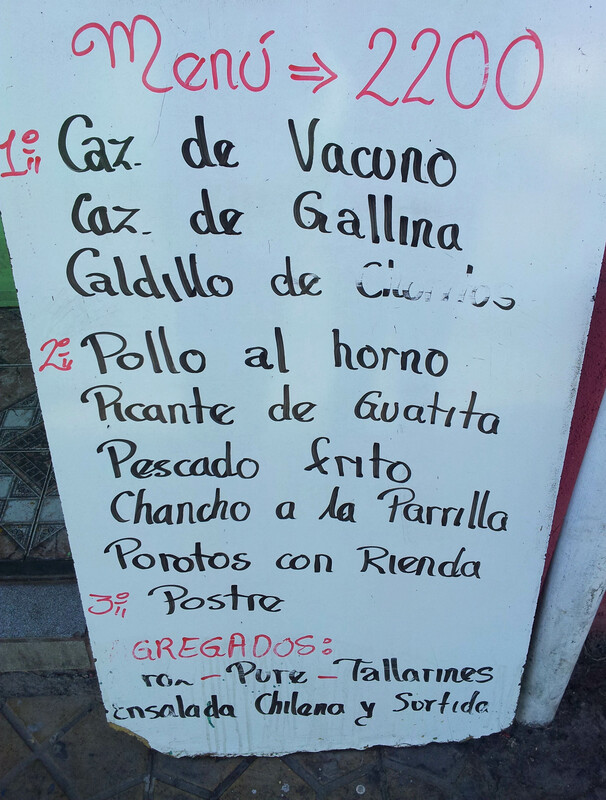 We start with soup, and T orders “Pollo al horno” (oven roast chicken), and I decide to be adventurous and try a local speciality (according to the waitress and my understanding of her Spanish), the Picante de Guatita. I have no idea what it is but I know it has something to do with a cow. Can’t be bad right..? WRONG! My plate arrives with a mountain of rice, 2 lettuce leaves topped with day old sliced tomato and some bright orange saucy concoction containing strips of what I can only assume is some part of a cow. Immersion, immersion, this is what the mission is, immersion..I keep telling myself. I inspect these strips closer and pop a piece in my mouth..and almost immediately gag. The spicy sauce hides the vile taste of whatever that is for just a moment longer than I would like to have it in my mouth.. I always say try everything twice, because the first time may be too shocking to judge due to unfamiliarity, but the second time you are aware of what you are getting into, leaving space to appreciate the experience for what it is – and of course decide if it’s for you or not. Try everything twice.. I did, and that particular experience is not for me. T is happy to share her chicken with me, although my appetite has disappeared. 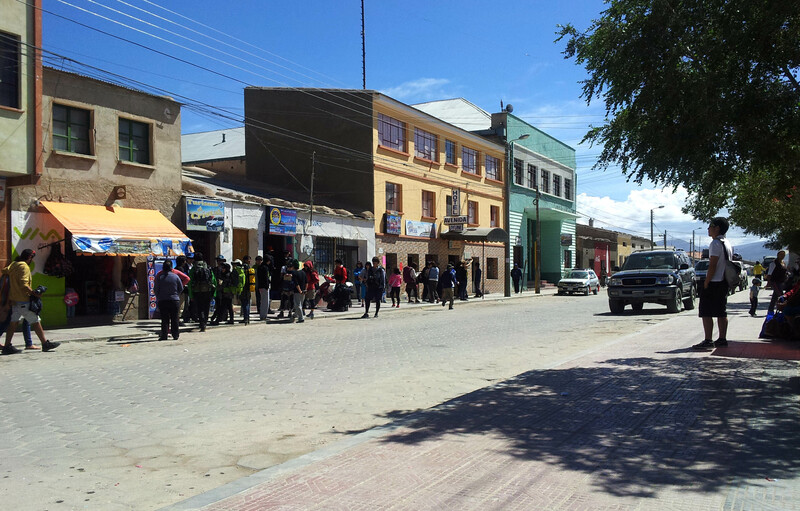 The bus to Uyuni leaves at 7am at 15 000 pesos per person. 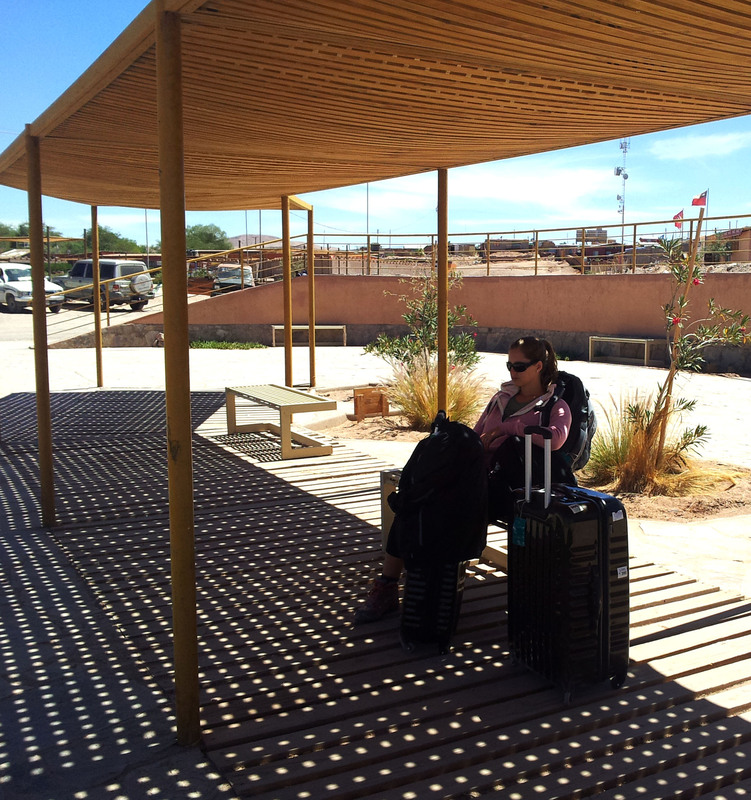 It’s supposed to be a 14 hour trip – 7 to the border, some time for exit and entry and then on to Uyuni. 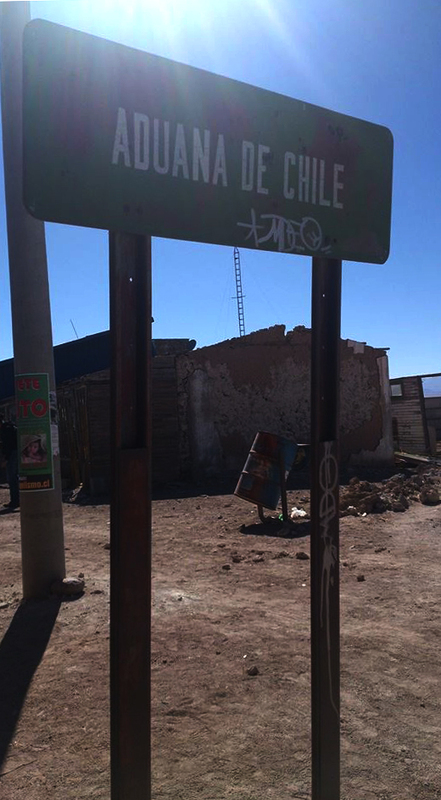 We make it to the border in about 4 hours as there have been some road improvements recently – actual tar has been added to the dirt. Things are pretty smooth exiting Chile at the desert border and we drive through no-man’s land for a while before our Chilean bus comes to a standstill in the middle of nowhere. Here we will swop busses with a travelling group coming from Uyuni on their way to San Pedro. Our Bolivian bus is decorated with flowers and ribbons and colourful paper maché masks. I like it! It is our first introduction to the Bolivian way of decorating everything that moves, EVERYTHING! Busses, cars, trucks, llamas, alpacas, dogs and I even saw a cat with a hat, and it had nothing to do with Dr Seuss. We continue on to the Bolivian migration entry office. It is literally a little drywall box with one little grumpy Bolivian man in it. We are first in line, and he looks at me with a very hostile look..as if I’m going to steel his stamp or something. Bolivia is the only country in South America (apart from the European Colonial ones..they don’t count) where we as South Africans need to pay for an entry visa. At 360 Bolivianos (+- R500) it is valid for 30 days. They only accept local currency or mint condition US dollar bills. Back on the bus and we drive and drive through vast Bolivian nothingness. It’s much different than Chilean nothingness, there is extra nothingness in this country, especially here on the outskirts of the outskirts. We are making good time on this super boring day bus ride and we make it to the hustle and bustle of Uyuni at 4pm Chile time/ 3pm Bolivia time. I love gaining time..
Uyuni is the gateway town for tourist who come to Bolivia to see the world’s largest salt flats – the Salar de Uyuni. It is 3 753m above sea level, which means it is very hot during the day, and freezing at night. Water supplies are very scarce, so the main industry for the 10 000 or so inhabitants of this town is selling all kinds of crap to the 60 000 tourists who pass through every year. Uyuni is very rural and you are extremely lucky to find a paved road in this small town. Unlike San Pedro, which was a pretend town for the sake of tourists, Uyuni really is run down to the extreme. Except for Avenida Arce, where all the restaurants are that target tourists – for some reason they all do pizza and Mexican. 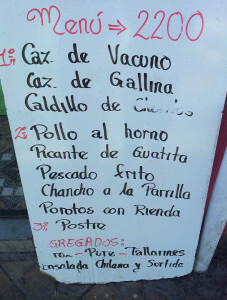 You can order a Regina with a side of tacos at every resto on this street. We spend the evening walking about town. We’ve lost Nathan somewhere because he can’t find an ATM that will give him cash with his American Express card. 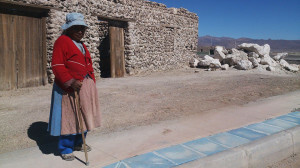 So be sure to have Visa or Mastercard when coming to Uyuni. T and I buy a big beer and share it in little plastic cups on the side of the street, watching the locals and tourist interact with each other at the street market. They are selling everything from fake cellphones to baby nappies to dried fruit and fireworks. We discover a row of foodcarts around the corner that serve little flat hamburgers with egg, tomato, lettuce, red onions, patty and fries, all for only BS 7! It is so cheap – and so easy to get very unhealthy here. Exhausted from the day’s travel we settle in to our home for the next two nights. Dear reader, this is the toughest thing about travelling like we have chosen to travel – we never have a home. We are never 100% comfortable. We have a remarkable ability to make any space we find ourselves in very homey, but it is never a wholly safe space. Travelling in this way with very loose plans that are made up as we go along, for what became a total of 6 months and 6 days through 6 countries with everything that is important to us strapped to our bodies, is an emotionally taxing experience that leaves one with a scar of incredible growth. Good thing I’m a fan of scars..
Hotel Julia on Avenida Ferrovaria is right across the road from the train station. It’s well equipped with spacious rooms and bathroom. The bed is quite old and worn – the kind where we roll to the middle without trying to. The hot water can be temperamental and the wifi works well enough. Although the password is a state secret and is changed every day. The staff are not very helpful and treat us as an inconvenience whenever we inquire about something. It may be because I drank more than one cup of water from the cooler in reception. 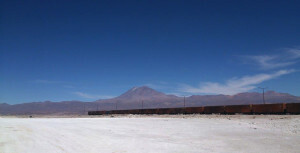 Tomorrow we will search for a tour operator that can take us to the centre of the world’s largest salt flats. It is also our 6 month wedding anniversary tomorrow, and I will take my lady out for a romantic Bolivian meal. 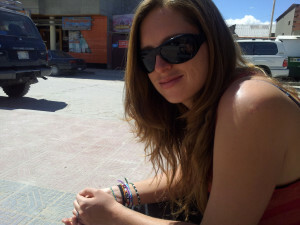 This entry was posted in Chile, Travel and tagged Atacama 2000, Bolivia, bus, Buses Frontera, Calama, Chile, food, Hotel, julia, mexican, Pizza, San Pedro, to, Uyuni, weird. ©Zulé Vuuren 2017 All content on this website is full copyright of the owner and may only be used with express written consent by the owner or its agents.